1: CV and publication list of the applicant. 2: An abstract of the dissertation prepared by the applicant not exceeding 1,000 words exclusive of figures and references. 3: A nominating letter from the research advisor citing the specific contributions of the applicant and their significance. 4: Up to two seconding letters. Nomination packages will not be renewed automatically but they may be resubmitted a second time. Applications from women and members of minorities underrepresented in the sciences are strongly encouraged. The selection committee will consist of the current chair, chair-elect, and past-chair. If any of these are sponsoring a candidate, they will be excused and the committee may include the vice-chair and then the secretary as needed. 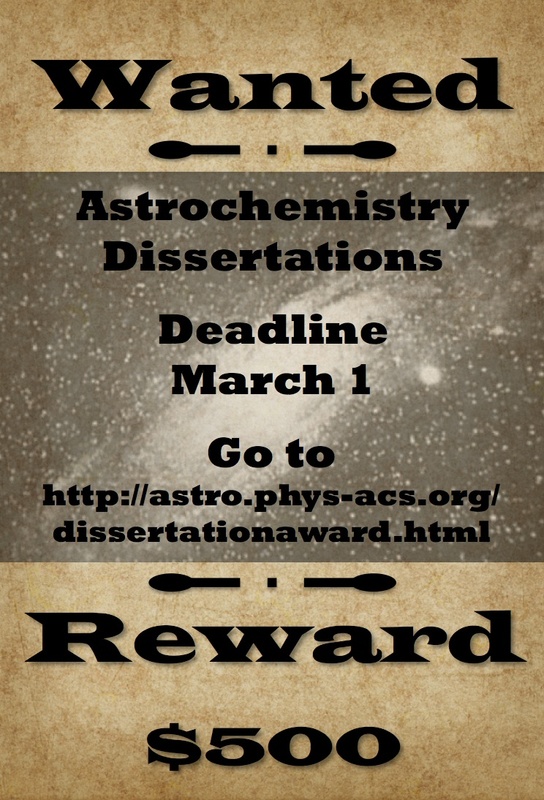 All nominators and the nominee must be a member of the Astrochemistry Subdivision. You can join for a little as $15 per year.